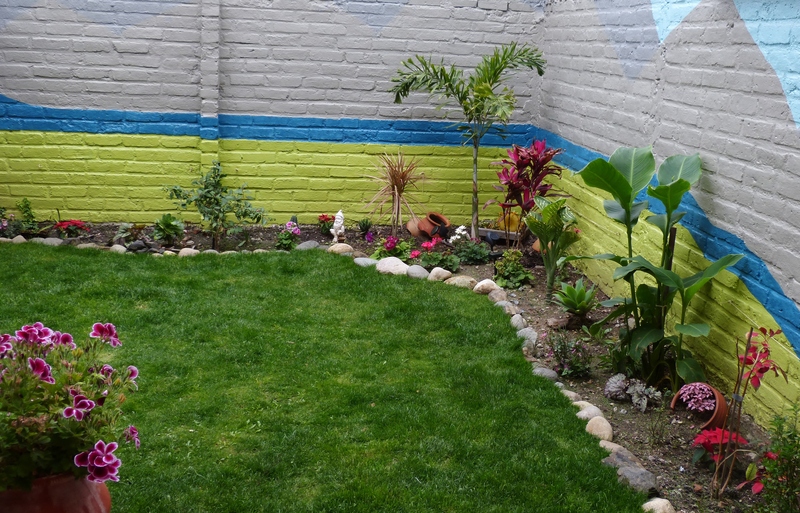 It seems, at least anecdotally, like many expats who move to Ecuador live in several houses or apartments within their first few years in the country. It takes a while to decide where one really wants to settle, and once foreigners get to know a city like Cuenca better, their sense of where they belong evolves and, in fact, matures, even as their understanding of the culture and geography grows. Sara and I are no different. We stayed in a bed and breakfast for several days upon landing, moved quickly into a large and renovated colonial home in el Centro for a month, while we looked for a more permanent place, the one in which we now live, a home in the suburbs that many of you have admired in past photos I’ve shared. So, as you might have guessed, Sara and I are moving. It’s official. Don’t worry. We aren’t leaving Ecuador. We aren’t going far, but even the short distance will make a major difference, as we are going from a cozy Cuenca suburb to the very center of the city. Don’t get me wrong. I love our current home. Sara does, too. However, it’s time for a change, and despite the loveliness of our house, it has no view, and it’s not near enough to the restaurants we frequent or friends we love. Sara painted a view on our garden walls. Here’s the deal. I want to be nearer my artist friends and have a larger studio space. And Sara, as an architect by training, wants to live closer to the UNESCO World Heritage Sites in our city. And she needs to live closer to her office. Now her commute is too long—from one side of the city to the other. We won’t be moving until August. But our new home will be a 3,000-square-foot, 4-level townhouse just behind Cuenca’s “new” cathedral—one short block from Parque Calderon, the square that marks the city center. Stay tuned for more details and photos. Have you ever made a move that was motivated for aesthetic reasons? Does having a view and an architecturally interesting place to live matter to you? Have you moved a lot or a little during your life? 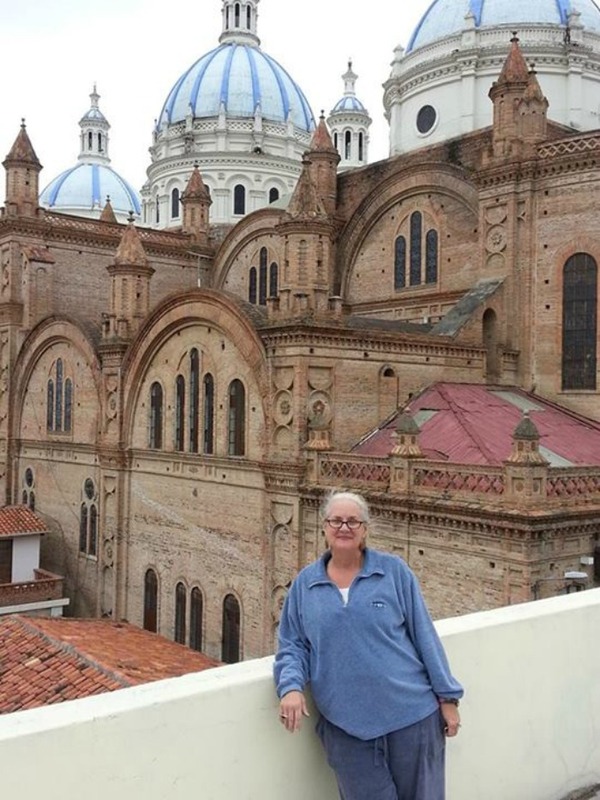 This entry was posted in Ecuador, home, moving and tagged Cuenca, Ecuador, el Centro, expat housing, expat living, expats, home, housing, life, moving, rentals, renting. Bookmark the permalink. Oh yes! Kathy, being in the center of the city sounds just perfect for both of you…and WHAT a view! Congratulations…I’ll look forward to more photos! Thanks so much, Cindy. Glad you like the photo. It is a pretty amazing view, and the thing you can’t see in that particular image are the Andes, which are awesome in and of themselves. Take care, my friend, and have a wonderful week! I moved from a beautiful place on the North Fork of Long Island (NY) to a remote village in Sardegna, Italy. I was moving all over Italy for years for 7 weeks a yr, and then had a full year living in 4 places for 3 months each in different regions, Sicily first. Eventually i found my current home, which was in ruins! took a couple of years to renovate but the bones were good and the space is great outdoors with 4 levels of terraces, one which has a modest pool. I am not a millionaire but I am happy with the results. Once i found Sardegna i thought first to buy by the sea but it was impossible to buy, an old stone independent house. I decided not to spend years looking for the perfect spot, waste of my time as I am in my, 60s now and wanted a studio to paint in and a house to live in, and a place for family to stay in. Took a lot of energy, have a view of the hillside which is very nice but the property is nice in itself. If we wait for perfection we could wait years to be settled…i didnt want to wait any longer. Wishing you good times in your new home, sounds big! But if you need studio space i can understand. The view is nice too! I am more of a country girl than a city girl so i am immersed in nature by choice. We have to know ourselves…. Thank you so much for your comment, Janice. Your experience is Italy sounds fascinating. I would love to read more about it, especially knowing you are an artist. And the description of your current home sounds divine! Thanks so much for stopping by and taking the time to leave a comment. And, please, come again soon. Thanks so much! I don’t like moving either. In fact, I kind of hate it. And we, too, have TOOOOOOO many books! My partner Sara is good at packing, but she is working long hours, so much of the work will fall on me this time around. Yuck. Great to hear from you this morning. And I will definitely post more photos. Yes, we do have a lot of those, don’t we?! LOL Will share more photos soon. As a child, it seemed my family moved around a lot. As I got older, so did I: college in Boston, grad school in Maryalnd, then Seattle, back to Maryland and San Diego. I’ve lived in my townhouse since 1998. Before that I had three different places here. After all those moves I vowed I’d stay put. I was tired of all that packing and unpacking. Moving to the city has an appeal but I worry that the traffic noise, etc, will keep me awake. I like the relative silence of suburban life. Love the photo of you in your new place. Looking forward to see what you do with your new place! Yes, the city can be noisy–very much so. However, here in Ecuador the suburbs are, as well–the chickens alone are loud. I think there is a lot to be said for life in a condo–the lack of maintenance would really appeal to me. Great to know you have lived so long in a place you love. Wonderful to hear from you, Monica. You must be up early this morning! Ironically up early because a neighbor, with a bunch of guys over, woke me up at 3am and I couldn’t go back to sleep! Oh, NO. So sorry! Hope you sleep well tonight! Congratulations on your upcoming new abode. I look at the moving trucks that block every alley in Chicago the 1st of every month and think, ‘I am so lucky I’m NOT moving.” One of the biggest reason I stopped moving is my friends got to old to help. :-D. This won’t be the last place I live but I hope a move is far into the future. That being said, your new location sounds like a perfect fit for your expat lives. I’m excited for you both. I have to agree, Katybeth. Moving is not fun. In fact, I kind of hate it. Glad you will get to stay put for a while. And I’m happy to hear you think our new place sounds nice. I’m excited. Hope Cole is feeling better! And thanks for stopping by this morning! Thank you so much. I hope it goes well, too. Wonderful to hear from you this morning. Hope you have a lovely day! Congrats!! Seems like a great move is ahead for you!!!! The view is beautiful and I know that you will make it your own once you get the possessions moved. We are going to be moving, too, . Chris starts a new job in Texas on Monday so the house will go on the market and I will move eventually when it sells. I am sure it is going to take awhile but at least we have the ability to fly to one another, right? Oh my, Beth Ann, that’s a big move! Maybe it won’t take so long for your house to sell. It looks lovely in photos. I’m happy for both of you, though I’m not a huge fan of the heat in Texas. Where in Texas are you going? Thanks for stopping by this morning. And I hope the rest of your week goes well! The plant he will be at is in Arlington (Dallas area) . We are leaving today to drive his car down and then I fly back on Monday.It has been an answer to prayer since he got restructured in late January. We are very grateful and looking forward to a new adventure! I lived in north Dallas for a few years. Dallas is a lovely town, especially if the heat doesn’t bother you. People are friendly. There are a lot of fun things to do. Congratulations. I’m so happy for you. And have a safe drive! Better heat than the snow I have dealt with the past 7 years! 🙂 I am ready for a change. Hopefully it will all fall into place like it usually does. Thanks for the well wishes! Yikes! You have had a lot of snow! Congratulations! Congratulations on the upcoming move … and the view is outstanding … and cheers to being in city center! Good luck. Thank you, Frank. We’re excited–and really glad this move does not involve having to sell our current home. As you know, that makes for an terrible amount of work and takes time. Great to hear from you this morning! Hope the rest of your week is awesome! Kathy! I am so excited for you! Did you find some outdoor space for your dogs, too? I can’t wait to see how you decorate your new space. I hate moving. Yikes…all those books you have to pack. But, I know it will be worth it for you to have a central location right in the center of the old town. The view looks familiar. We stayed in a fabulous studio near there, owned by a man named Dr. Juan. I think he’s an orthodontist. Good luck and enjoy your new digs. Can’t wait for the update. Thank you, Debbie! Yes, there will be a lot of packing. And we have TOO many books. I don’t look forward to the process moving, but the outcome will be awesome. Glad you like the view. WE love it, too. We will have a massive terrace that overlooks the cathedral. No grass, but more outdoor space than we have now. Wonderful to hear from you this morning! Thank you, Robert! Glad you like the new place. I suppose there is a bit of the gypsy in us, as well! Great to hear from you, my friend. Have a wonderful week! Apparently my Gravatar has also moved- hmmmm- love the new spot! Hmmmmmm–where did she go? Thanks, Emily. So glad you like it. We can’t wait to start working on it. Hope you have a happy 4th up there in Canada. David and I definitely know that feeling! Our first abode was Green Acres and current as you know is a lovely house BUT surround sound dog barking and we have have had it! Come October we hopefully move again closer to el Centro…..It has become a sort of Mecca for expats. Can wait to see the progress you and Sara make with this beautiful new place and WOW patio parties galore! Yes, yes, Juan, can’t wait for the parties! And you all have indeed been through this, as well. Hope you find your perfect place soon, and hope that it’s close to us! Hugs to you, my friend. I admire your flexibility. I’m inclined to settle down and make the best of it rather than having to do all that packing up and relocating. Even in my teen/collage days I really avoided moving as much as possible. Several of the places I lived for months at a time I never bothered to move my “stuff” in. I’ve been in my current home for 20 years and dread the thought of having to move again. Best wishes, the new place sounds lovely. Fascinating comment, Lisa. I have heard of folks moving places and not unpacking, but I’ve never heard of moving without ones stuff. You must move some stuff but not stuff in the larger sense. Fascinating what makes us all tick. 20 years is a long time to live in one place! Great to hear from you today. Thanks for stopping by! Ha, ha! Moving does, indeed, help with closet management. We are SO excited about our new place. We will have some awesome parties. Can’t wait to show it to you! I love the view that Sara painted on your garden walls. Your new view is indeed spectacular. Lucky you to be surrounded by beauty wherever you go. Thank you. Will be sure to tell Sara you like the painting she did. We are looking forward to “view” in the literal sense, however. Wonderful to hear from you this morning. Hope your week is going well! I almost missed this blog!! Than I got distracted by the comments and replies! I would never get to the bottom of this. Move Jeff! Ha ha! Your present home is so warm and welcoming, of course I haven’t been there but I have taken the blog/photo tour! You two have made a lovely space to live in! I do understand you need to be closer to work, friends and creative opportunities. All the best! SO happy you didn’t miss it, Jeff!!!! Yes, get a MOVE on it! LOL Glad you’ve enjoyed the photos of our current space. We like it, too. But, wow, we love this new place SO much better. Stay tuned. And, by the way, LOVED your “trash” photos! Hey my attention is on the intention of a visit. Just finances are a bit low and slow… you know! Yes Thank you, thank you for the lovely praise of my new project!!! I am most grateful! It’s all about intention, my friend. We intend the same. And I understand the finances thing! God, hate that! WE are grateful for your friendship, no matter when or where we get to see you! Happy 4th, dear Jeff! Kathy, as you know, and have seen, my Soul for all my life longed to be exactly where I am. This mountain is where I am SUPPOSE TO BE. I dont know why. I just know and have known since I was small. I knew what my house was suppose to be like since I was was a young adult; I played with the design all of my adult life until I was 50 then made it a reality. IT IS WHAT IT IS SUPPOSE TO BE. I dont know why. I just know and have known since I was small. Here, I always know Peace. I dont know why. I just know and have known since I was small. When I have to leave the mountain to visit my children who all live in the city or drive to town to buy groceries, my Soul waits on the mountain for my return. When I feel scared….like when I’m in the dentist’s chair, I close my eyes then “go” to the mountain… Peace engulfs me. I never feel lonely, though I am alone and without neighbors. I never feel afraid though no one is here to protect me. I always feel Peace, Comfort, and Communion…..and, I STILL DONT KNOW WHY. And your mountain is a gorgeous place. I remember visiting there once. In fact, I once wrote a poem about that visit. So happy you have found your place on the planet. And glad you now have, at least, those precious pups to protect you! Wonderful to hear from you, this morning, my friend! I know my reply didnt answer your question but your blog today just caused all of that stuff to erupt…I dont know why. My next move will be on to Glory. No need to answer the exact questions I asked. I just love getting comments. And your place is hard to beat. Sara and I debated long and hard about being in the city center or out in the country. We wanted one or the other. We are not real suburbs kind of people. Hope that final move is a way off, my friend. I would move too for that view. It is fabulous. I love to be right in the centre of things. At Ponte a Serraglio I can see what is going on in the piazza and see if there is anyone at the bar I want to talk to, it’s great. SO glad to hear you, too, would move for the view. I have to agree. I love to be where the action is, even if I choose not to be a part of it. I love the energy of urban living. Great to hear from you today. Hope you have a safe trip back to Australia! Even though the move sounds like it might be a lot of work, I think it’s cool that you’re moving downtown closer to the ‘center of your Ecuadorian heart’. You inspire with your willingness to take risks and keep moving when the spirit calls. Hugs to you, from a Kathy who has lived in the same place for the last 32 years, but sometimes dreams of other Kathys. Wow, I didn’t realize you had lived there for 32 years, Kathy. That’s along time. And since you are a country person, I think it’s pretty cool that to you an urban move would have any appeal at all. Wonderful to hear from you today, Kathy. Hope you have a lovely 4th! I LOVE the city, Kathy. Always enjoy visiting it. Might even like living in one (maybe?) some day in the future, but not with the current husband, lol. As well as being married to me, he’s equally married to Lake Superior. Seeing your new space was delightful! I have lived the tension between staying put and moving out into the world since I was a child. Believing home is where the heart is…Joanna and I have created great spaces together! No doubt you two will create a lovely home, as you have before…your hearts filled with such love, life, and passion for all that is good and beautiful! BTW we looked at an apartment on north Tarqui…great apartment just farther from the park than we would like. Oh, cool, Stacy, so glad you hear that you all looked at a place. I will keep my eye open for you. I like Tarqui. How far north was the apartment? Do you recall? We were SO thrilled to be able to show you our space. And we are hoping you all move CLOSE to us! Hugs to you both! And thanks so much for the comment. We loved having dinner with you the other evening! I don’t know if I’m good at it either, Charlie. I will definitely share more photos. Great to hear from you today, my friend. Hope you all have a wonderful 4th! I wish I had the flexibility to move for inspiration. That looks like a great choice for you both. Thank you so much, Lisa! I know we are blessed with flexibility. I need to remind myself of that more. Hope you are well, my friend. I’m SO delighted to hear from you today. So when are you going to come stay in our new guest room? I wish I could say soon, but life has gotten a little complex so . . . Sorry to hear about the complications. Hang in there, my friend. You are welcome, whenever the time is right for you! Just remember that! That is a great view and photograph. It sounds like you and Sara seized onto a terrific opportunity; can’t knock that. As for me, I’m a nester by necessity. NYC rents are sky high and I can’t afford to own. If I lost my place I could never afford to continue to live in the heart of Manhattan’s Upper West Side. Maybe you guys would let me crash in your guest room indefinitely. I’m low maintenance. Yes, my obsessive checking of classified ads final paid off after two months. We are excited. Could not be more in the heart of the city. Anytime you want to crash here, just let me know, dear V! Our guest room door is always open. Hope you have a wonderful 4th, my friend. Any big plans? No big plans. I’m still recovering from attending Pride with Milton on Sunday. Hope you have a great 4th. No plans can be better than too many. I am in the process of decorating a loft. What a challenge! Wish I had your creative talents to make it a cool place The walls are icky green and gray; ugh! Oh, thank you for your comment! Thank you for taking the time to read and look at the photos. Good luck with your loft renovation. And I promise to provide more photos! Please come by again soon. Wonderful to have you visit! Dude. Sorry to hear that you’re moving again… As moving boxes and boxes and boxes seems endless but I am happy about your view. It looks amazing! Hope you definitely enjoy your new digs. The four times I’ve moved have all been because of rent/money it was crazy. Thank you! WE are not looking forward to the moving itself but are REALLY excited to be living in a place with an amazing view. I will keep you all updated with the details and photos. Great to hear from you today. Hope you have an awesome 4th of July! Best of luck as you transition through your move. The physical part of packing and moving is never too much fun, but thankfully, then you get to the fun stuff – nesting and decorating in your new space. With your creative flair, I’m sure the new place will take on the spirit of adventure in no time at all. Yes, it would have been nice to have grass, but since our terrace (roof top) is so huge, Sara is threatening to plant a patch of grass up there. We shall see how that goes. Getting the soil up there could be an issue. LOL But yes, the view is worth it. Let’s just hope the dogs agree. And, gosh, you are right. We can’t wait to start decorating! Gonna be fun. I’ll be sure to share more photos. Hope you have an awesome 4th, my friend. It’s always wonderful to hear from you. Well, Nikki, let us know if you want to visit. We’d love to have you and give you a chance to experience that view in person. Yes, I suppose, we have moved a lot, but two of our “moves” overseas happened while we still kept our house in Lexington. There was little moving of stuff, at least. Hope you have a wonderful 4th. Say hi to Lexington for me! Great to hear from you!!!! Another adventure for you and Sara! How exciting. Sometimes it takes a while to decide what neighborhood / area suits you best. Your current home looks lovely but I’m sure the new place will be terrific. Can’t wait to see photos. Will Ralph and Lucy have a patch of grass to call their own? Yes, it does take some time to decide on a neighborhood, especially in a country you’re not familiar with. I wish we had grass, but we do have a huge roof-top terrace that is all ours. Sara is threatening to grow grass there. We’ll see if that happens. Hope you and Reggie have a wonderful 4th. Great to hear from you!!!! Well, I just moved from Southern California to Northern California, and while it wasn’t quite the whirlwind odyssey that once moving to Palm Springs for three days was, it’s been it’s own kind of madness. Nor does it measure up to the drama inherent in my move, once, to Las Vegas for six weeks. And, of course, nothing will ever compare to my decision to go to Gay Pride Day in London 15 years ago at Noon on the day the flight was to leave, nor the flight I almost missed three days later when it was time to return, but generally speaking, I think I can say, from a position of some authority, that if you can make it for 18 months, you’ll probably stay a while. Your mileage, to and from your mood swings, may vary. Packing to Move is something best left to people who don’t have to review every scrap of paper they’ve ever jotted a word on, listen to every CD they find, and thumb through every book they own in order to determine why they got it in the first place and do they wish to keep it now! This, of course, is something only professional movers dispatch with any real authenticity. On my recent move I found five versions of the same manuscript of a book I began 15 years ago and might want to publish. It’s a good book—well, I can’t answer for all five versions, naturally, until I actually sit down and READ all five versions (which is why they could not be thrown away). Then, too, there’s my utter inability to date label my manuscripts, together with a code key indicating the prevailing mood I was in when writing it (i.e. angsty, tragic, hilarious appreciation for the absurd, dramatic, romantic, comedic–say, don’t those last three kind of go together?). I would need that key code to determine which version has the most universal appeal assuming there’s no homicide involved, unless homicide is hot these days, and apparently, it is. But, no, I didn’t code key OR date any of the manuscripts, so I either have no book, one book, or up to five books to publish, depending on whether or not the plot changed in the various versions. A quick cut and replace for names and places and bingo, five books I wouldn’t have had, maybe, if I had not packed all five manuscripts! Imagine throwing away a masterpiece just because moving five versions of it was one more box, one more label, one more 30 pounds to lug around! No: Madness does, and should, have its dignity. Therefore, in conclusion, may I simply suggest this handy rule of thumb if you wish to avoid the serial toting-around-forever syndrome in which I have found myself? Basically the rule is this: If you haven’t seen it, missed it or needed it for six months, throw it away. The other alternative is to bribe people to help. I find that has multiple advantages, not the least of which is the acquisition of food and cold drinks, unless it’s cold out, then you’d want hot drinks. Unlike the person actually moving, bribed people don’t skip lunch and let their blood sugar drop to dangerous levels involving snap decisions not to move after all. They are very big on the “you buy, I’ll fly” arrangement. So! A few boxes, a few bribes, a few burritos and presto: you’re moved! Trust me, I make things up for a living! 😉 Sorry for the long post, but there’s no way to handle this subject without a full and fair disclosure of what you’re headed for! (WHOA: Who got way smart and HAD TO WORK during this transition? Heh.) LOL! Yes, that is a great motto, but one I have never been able to abide by–I fear. I tend to be a person who accumulates too much stuff. And I have a number of manuscripts myself–none of which I’d be willing to part with either. Sounds like you’ve had a number of moves. Wow. Does it really count as a move if you go somewhere for only a week? Is that a move or a visit. Either way, you have a lot of positive energy. Hope you are able to put find a great outlet for it. Writing may be a good one. Thanks so much for your comment. It’s wonderful to hear from you. Hope you will stop by again soon. Why did you choose to move to Ecuador? I’m planning on grad school in Quito, but I’m intimidated by a move to another country. We chose Ecuador for a number of reasons, some were economic, some were about the amazing climate in the Andes. It’s a beautiful country with kind and caring people. Hard to go wrong here. If you hate, remember you can always go home. Give yourself permission to do that and the decision will be easier. Hope you make here one day, Caroline. Thanks for your comment and stay in touch! Thanks for the advice. I sincerely look forward go reading more of your posts. You are so welcome. I stopped by your blog a bit ago and was so struck by the strength of your poetry. Okay….wow….. It has got to be a little sad, or maybe it’s kind of cheerful now that I wrote that, about leaving parts of yourself behind every where you go. I can’t say I blame you for that view. If I don’t get to see you there SOME day I will be very sad. I’ve never had the chance, yet, to make such a creative move. Some day. 🙂 I so admire your adventurous spirit and courage to live it. Gosh, I feel sure you will get here one of these days. Sara and I still think a visit from you and David is inevitable. You are both adventurous. And you have a heart that is FULL of courage, Colleen. I fully believe it. You will make when the time is right. Hugs to both you and David from Sara and me! And it will! When the time is right. And it will be all the more exciting when it happens, the longer we have to wait. I’m a delayed gratification kind of person. 😉 Then you will be greatly gratified! Hahahahahahahaha!!! And it will be incredible! Best wishes for a location in town that agrees with both of you. I care to be close to public transit, bike routes, some shops for food and to see some trees from my window. I need to see some green.. Yes, we like to see green, too. The thing that you, unfortunately, can’t see from these photos are the Andes. We are fortunate with this place to have a view of both interesting architecture and natural beauty. Thanks for stopping by. Hope your week is going well! How exciting! You girls really aren’t suburbs ladies anyway. You’re heart-of-the-city women so this move makes perfect sense. Can’t wait for pics! 4,000 square feet?!?!!? That’s larger than my sister-in-law the optometrist’s house! Movin’ on up! Thanks, Sista. Yes, city people. What can I say? But not 4000 square feet, just over 3000. Hope I didn’t type that incorrectly. Will go check. But it’s bigger than our house in Lexington. And in some ways, we are moving up–literally! Our place starts on the 3rd floor and goes up from there. LOL Hope you are doing well, my dear! Summer vacation–not your favorite, as I recall. I wished I could have moved into your house when you leave, but I know I also want to be right down in El Centro too! Hope to run into you someday later this year! Hope the move goes smoothly, Moving stuff is no fun, but it will be over and you will be settled before too long now! Yes, I would recommend el Centro to any single women, for sure. It’s close to everything. We have a number of folks who are interested in our house, so it will rent quickly. I DOOOOOOO hope to see you later this year! Any idea when you might come? That’s an amazing view from your new terrace – I love the blue on the domes and how your blue shirt picks the color up from above. Are the blue domes part of the brown building or are they on another building behind it? We definitely moved into our condo twenty years ago for aesthetic reasons. We loved the gray-blue board and batten siding on the buildings and the birch trees and gardens near our unit. There is a woodsy nature park and salt pond behind us, and a beautiful beach and a small university campus down the road. I’ve only lived in six places in my life – most of my life in just three of those – I’m pretty much a homebody – the idea of uprooting and moving fills me with anxiety. Great question, Barbara. The blue domes are part of the same cathedral–all one building. I love the color, too. Your setting sounds delightful. Plus, the beach is hard to beat! And wow, you have lived VERY few places. I think that’s cool. Great to hear from you, my friend. Hope you have a happy 4th! Gorgeous! For a second there I thought you were moving next door to the Vatican. I am very drawn to aesthetics. Even though we had to “downgrade” to an apartment, we picked a nice one on the top floor with a view of tall trees. So, I get it. And it sounds like this is a smart move for both of you. Looking forward to seeing lots more pics! Yes, doesn’t surprise me that you all make decisions based on aesthetics. I would expect no less of you, Mark! Plus, you have a fireplace, which I envy. Hope you and Tara have a wonderful 4th. Great to hear from you today! Bless, you are better women than I. I couldn’t do this truly. But the view, how spectacular. Will you miss the garden? Will you get lots of help for the move? I know I would! Can’t wait to see more pictures my friend. What an exciting move ! As much as I like the painted wall on the courtyard, the view from the new terrace is amazing. Hope the move goes smoothly. Oh Kathy, what a fantastic view. I am jet lagged and tired from our trip home to California. Sri Lanka was amazing, I had to stop by and comment on your move… I can’t wait to see what you and Sara do with your new place. Your current home is so cosy, warm and inviting. I would love to see where the books go. Congratulations my friend. I am moving in the next year – it is not with a view and not one I am looking forward to. That’s for another time though… 😉 I will gripe about it, I know. Your new home looks like it’s going to be absolutely PERFECT — meeting all of the aesthetic criteria — for you and Sara! Like you, I would move in a heartbeat if I didn’t have a view that didn’t feed and nurture my creativity. I can hardly wait to see the photographs once you two are re-settled! Hi Kathy! This looks fabulous! I am absolutely with you and love, love, love a beautiful view. For now, my home choices are sensible (with some views) but once my kids are out of the house, I definitely intend on moving to a smaller place with a VIEW. Possibly a sea view. Or there are these fabulous suburbs in Joburg, with older houses with pressed ceiling roofs. A small garden and walking distance from a coffee shop of sorts, that would be my dream. I have travelled a LOT as a child, too much in fact, so I quite like to be a bit of a homebody now… Enjoy your new house!! I love the garden walls, but it’s hard to argue with that view of the cathedral. I’m sure the inside of your new place will look as alive and beautiful as your present home. Can’t wait to see it. How exciting for you and Sara! I can’t wait to see pics of your new place and how you’ll decorate it. Nope, I’ve not moved much in my lifetime. I just keep reinventing the same space I’ve lived in for 26 years now. If it weren’t for jobs and needing to be near our parents though, I’d love to try out new places! What a fantastic view and I totally understand why you want to. We’ve lived in London for three years and we are now in our third flat. Each place has brought a new level to our experience and helped us understand our new city a bit more. Best of luck with the move! Kathy! It’s so great to see that the two of you are flourishing in Ecuador! I thought the picture of your new view must be a joke obvious to those who have been reading more faithfully. It’s been far too long since I’ve visited. Silly me. Wishing you continued fun, love, and inspiration in your new home. Wow! What a view! I would move for that alone. I am with you as far as wanting to be nearer to cultural sites, restaurants and overall interesting opportunities. I pray your new home will be a place of refuge and that its walls will know much laughter and times of great fellowship with dear ones. Enjoy! Enjoy! I was wondering where you went to, what a move!! All the best to you. Kathy, where are you these days? Miss you very much! Oh, Monica, thanks for the note. We are in the process of moving (only about 2 miles); it has been a long ordeal–but will be wonderful in the end. We should be settled in a week. I swear, things should return to normal soon! So settling in well in the new digs, Kathryn? Hope everything went smoothly with your move 🙂 I can’t wait to hear how you’re settling in, and have missed your posts! Look forward to reading about it soon. I miss you! Hope all is going well. I hope all is well. Moving no matter where is stressful and exhausting. I haven’t been around the blogosphere in far too long, but was just thinking of you and wanted to stop by and see how things were going. I miss seeing you! Obviously you’ve been busy. I hope you’ll catch us up when you can! I miss you all too. But guess what? I just posted a new piece FULL of recent photos and video of our new home in the city, the recent workshops I’ve taught, and much more. Thank you SO much for the comment, my friend. I will INDEED keep smiling. I’m delighted to hear from you, even if I’m criminally slow so to respond to your comment.